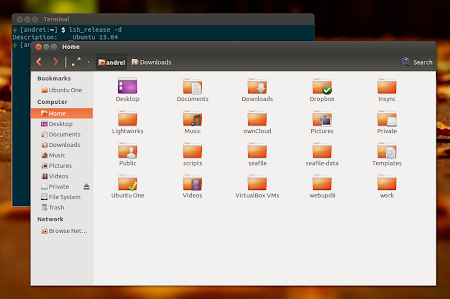 Ubuntu 13.04 uses Nautilus 3.6 by default, for which some features that were available in Nautilus 3.4 are no longer available, such as the dual pane view, sidebar tree view and more. other minor features like displaying the icons in the pathbar for Documents, Downloads, etc. ... you can install the patched SolusOS Nautilus 3.4 which I've uploaded today in the WebUpd8 Experiments PPA for Ubuntu 13.04 (Raring Ringtail). This patched Nautilus is also available for Ubuntu 12.10 and 12.04 in the same PPA, as you probably already know. The Nautilus 3.4 package in the WebUpd8 Experiments PPA also comes with all the patches from Ubuntu (12.10) (as opposed to Nemo for instance, a Nautilus 3.4 fork that has a very nice set of features as well). Note: if you're using the GNOME 3 PPA, you have Nautilus 3.8 so the instructions below won't work! This is only for those who are using the official Nautilus 3.6 packages from the Ubuntu 13.04 (or 12.10 and 12.04) repositories. Also, please note that if you encounter bugs, I cannot fix them since I'm not a developer and I only maintain the PPA. However, if that happens, you can easily revert the changes. Warning: if the dist-upgrade command tries to remove some packages, it means your system is broken and you need to fix this before proceeding; do not continue with the upgrade if that's the case. That's it! Now open Nautilus and you should have the SolusOS patched Nautilus 3.4.